De vogelpopulatie op Aruba is zeer gevarieerd. Van de Bruine Pelikaan met een spanwijdte van twee meter tot de Blauwstaart-smaragdkolibrie, die niet verder komt dan 8 cm. Allemaal hebben ze hun plaats gevonden in dit prachtige fotoboek, met op het omslag de Shoco, het nationale symbool van Aruba. Birds are fascinating creatures. They are descendants of dinosaurs and connect us to the far gone past. Like bees and bats, birds play a significant role in nature’s evolutionary clockwork. They pollinate flowers and spread seeds. They help keep insect populations in balance. The state of affairs of our birds is an indicator for the state of affairs of nature as a whole and so they also connect us to our future. Archeological findings of bird like remains date back some 150 million years and evidence demonstrates that the bird wildlife of Aruba predates any human’s first steps on the island. Natural phosphate was found in the nineteenth century which originated from sea bird droppings. Over half a million tons of phosphate were exploited. Such commercial quantities can only come about in areas where large numbers of birds congregated over many years. Terns and gulls have been using Aruba as a nesting site for thousands of years. The variety of our bird species is fascinating. Some endure our times of drought; while others have difficulty doing without our waterholes. The nest of our Shoco is in the ground while the Prikichi breeds in termite nests in trees. Our Brown Pelican has a wingspan of up to 2 meters, while our Blue-tailed Emerald has a body length of only 8 centimeters. We have simple colored birds and we have our Dornasol, our Ruby-topaz Hummingbird; a true magician of ever-changing sparkling colors. Aruba’s terns breed by the thousands, close to one another while our female Blue-tailed Emerald takes care of her chicks alone, in a nest she has hidden from anyone’s sight. Our Patrishi or Crested Bobwhite walks around slowly while feeding and our Peregrine Falcon hunts at phenomenal speeds. Some of our birds are carnivores, others are vegetarians. Some hunt in our skies, some in our trees and some even under water. Some are quiet; others are true musicians. And so we can go on. It is this variety that makes our island’s bird wildlife so fascinating. Just: … Imagine Aruba! From hobby, to passion, to purpose. What started out as a hobby at the turn of the millennium, grew into a passion. Passion led to purpose. 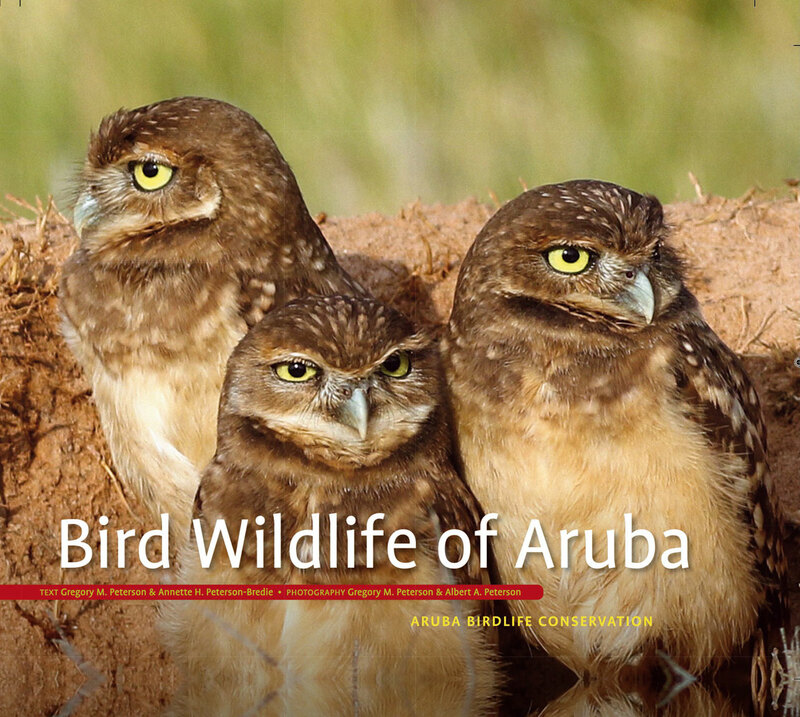 To date, Aruba’s bird wildlife is not sufficiently protected. One of the main purposes of Aruba Birdlife Conservation is to preserve Aruba’s bird wildlife for future generations, including many micro habitats which our local and migratory birds need to survive. The roadmap to this destination is paved with awareness, education, lobby work, projects, and so forth. One such project is this book.